20 years ago, Mani Malaichamy came to Singapore with empty pockets. Back in a small village in Tamil Nadu, India, his parents slogged as rice farmers, who often had to borrow money when droughts destroyed their crops. The family’s financial status was really bad, and they even had to rear goats in order to supplement their income. One good thing though: there isn’t much to spend living in a ‘kampung’. And because they planted their own rice and vegetables, food was not scarce for the family. Mani stopped schooling at age 17, and his highest qualification is a secondary education at a village school. He didn’t pursue his studies because of financial constraints, and he would much rather work to earn money. He wanted to secure a good-paying job that that would allow him to build his own house, as well as help his parents pay off their debts. But jobs were unfortunately very hard to come by, and this sparked his desire to come to Singapore to work. “There were many agents in my village recruiting workers to work here,” recalled 47-year-old Mani. The only obstacle was their hefty commission charges. 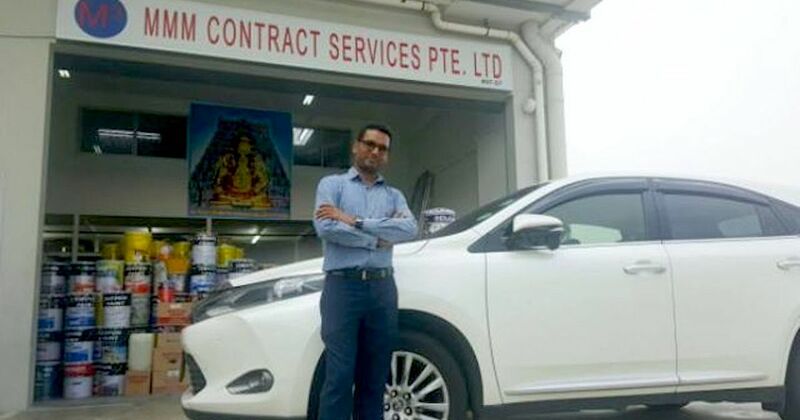 According to The Straits Times, when Mani was 28, his brother-in-law – who was a migrant worker in Singapore back then – coughed up $4,000 to get an agent to help him find a job here. Thanks to the help, he secured a job at property development company Fook Tong Nam in Marine Parade. Because he was slightly proficient in English, he was assigned to work at one of the company’s new condominium developments in Bukit Timah instead of a regular construction site. He was tasked to paint and fix minor defects in the condo units; and was paid $18 a day, earning a few more dollars if he worked overtime. “I worked every day, from Monday to Sunday, from 8am to 7pm, and until 10pm if there was overtime. My pay was about $600 a month, I don’t go out except on Sunday evenings when I finished work,” Mani told ST.
His meagre pay clearly did not match the high cost of living in Singapore, but Mani was very thrifty and would stretch each dollar to the fullest. He was grateful that his company allowed him to sleep at the site office, so he didn’t have to fork out any money for accommodation expenses. For meals, he would cook his own food on an electric cooker in the carpark outside his site office. As he scrimped and saved, Mani was able to pay back the $4,000 debt to his brother-in-law in a little over a year. He would also occasionally remit money to his parents in India. Besides that, Mani would set aside some money to attend English classes at a school for foreign students. He also got himself certified by the Construction Industry Development Board not long after. After four years in Singapore, Mani’s daily pay increased to nearly $30. His savings grew and he soon had enough money to get married, so he returned home to India. His parents arranged a marriage for him – he was 32 then, and his wife was 40. Despite being older than Mani, his wife was better educated than him, holding a Master’s in Commerce from Alagappa University. But this did not faze him at all. According to Mani, many women in India are very educated but never work. So it was up to him to be the breadwinner of the family and financially support them. His savings weren’t enough to buy a house and he also had to foot the bill for his sister’s marriage, so he had no choice but to return to Singapore to continue earning money. It took him eight months and another agent to find a higher paying job here. By then, his wife was also expecting their first child. This time round, Mani worked at ATC Painting Specialist, a painting company owned by a Mr Ang Ah Teng, who later turned out be his good friend and mentor. “I did many things [there]. I was driving a lorry, fetching workers, collecting cheques, making payments, supervising, taking care of projects,” he said. He also attended a three-month course to earn certification as a safety officer, and was soon promoted to a supervisor – this meant annual pay increment and bonuses. 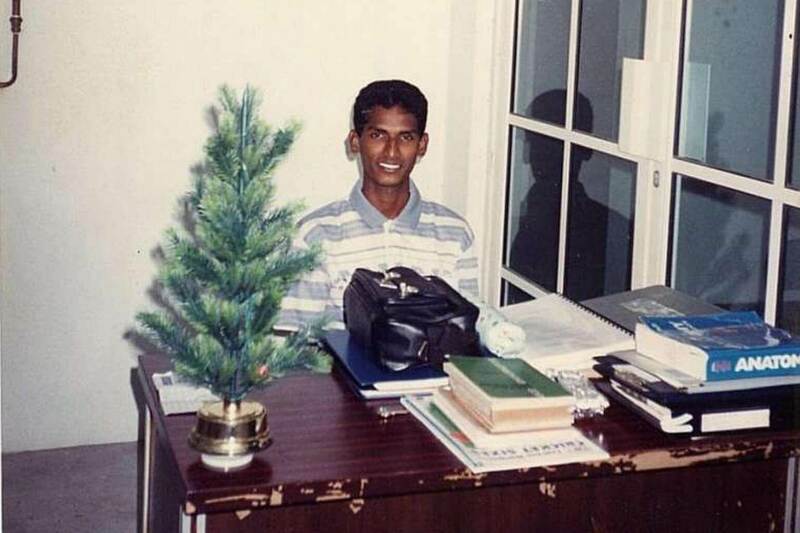 By 2005, Mani was earning nearly $3,000 – enough for him to obtain an S Pass, which is granted to middle-level foreign workers. He ended up listening to Mr Ang’s advice and the following year, he managed to get them to be permanent residents here. It wasn’t an easy journey though. He had to save up a lot of money, and could only afford to fly back to India once every five years. He only got to see his firstborn till eight months later, and also had to miss his late father’s funeral. 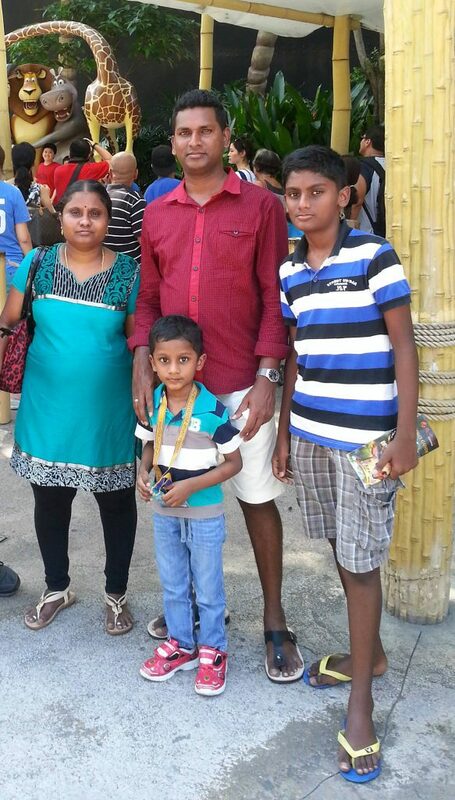 His wife and elder son Arul Prakash, now 15, came to Singapore in 2005 and lived in a one-room rental flat in Bukit Merah. A few years later, he bought a three-room HDB flat in Bedok on the resale market. In 2010, he was blessed with another son – Areesh Prasanth. Mani has always wanted to be an entrepreneur and start up his own business, but he didn’t want to abandon his boss who has kindly taught him everything. “Without him, my family would not be here with me,” said Mani, expressing his gratitude. On the flip side, Mr Ang nudged him to spread his wings and strike out on his own. He would tell him to “go out and fight” and reminded him that he’s free to return to work for him should his venture ever fail. Motivated by his warm words, Mani set up his own painting company called MMM Contract Services in 2007, while still working at ATC. Three years later, he finally quit ATC and pumped in $10,000 of his savings to commit to his business full-time. The first high for the company was securing a major contract worth $150,000 to paint a factory in Woodlands. In 2015, Mani forked out another $420,000 to establish his own office at Kaki Bukit. His company raked in $2.6 million in revenue last year, and its headcount also grew to 26 employees today. Besides MMM, Mani also owns another company specialising in electrical services. “I’m very lucky. All my Singaporean customers have been very good to me. They like me and give me a lot of jobs,” said Mani. Even Mr Ang, who is technically his competitor, passed him contracts, including a painting job of Greendale Secondary School. This opened doors for the company, and they continued to sign contracts with other schools such as Marymount Convent and CHIJ Katong Convent. Mani appreciates Mr Ang’s kind gesture, and aspires to be a good boss like him. He often organises company trips to Malaysia and invites them over to his home for meals. “When you treat them well and become their friend, they will be so happy to work for you,” he said. Looking back at his journey thus far, Mani finds the success he’s enjoying today somewhat surreal. Mani was once penniless, but he braved through waves of struggles to get to where he is today. His unwavering determination, hard work, Mr Ang, and his God – these are what contributed to his success. 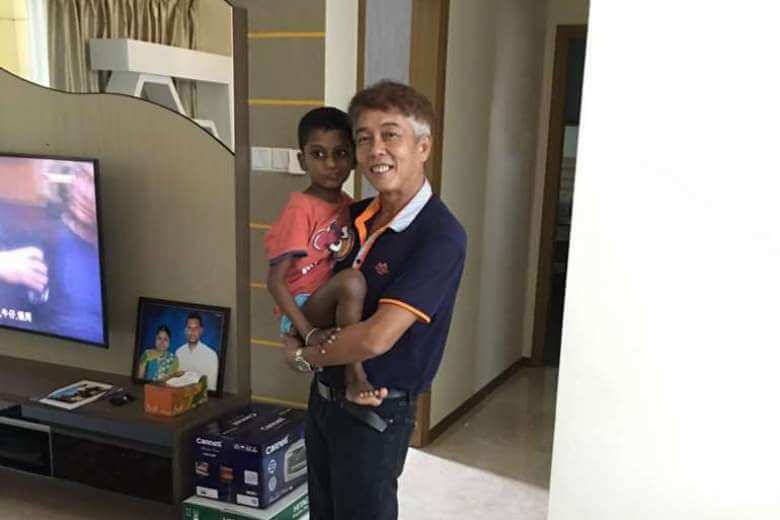 Last April, Mani and his family even moved into a $1.2 million condo in Pasir Ris. “I used to paint condos, but I never dreamt I would one day live in one,” said Mani.